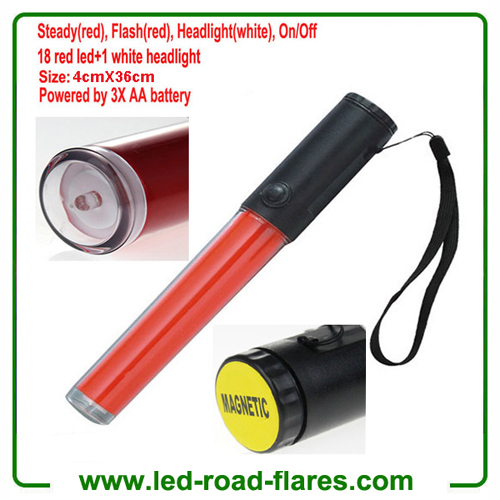 Traffic wand (also called traffic baton, guiding torches or signal batons) are an effective way to guide traffic and widelyused by traffic control, under construction site marshals, parking attendants etc to channelize traffic.The 36cm led traffic wand is with 3 Modes Red flash, steady red and white LED headlight . This super bright compact & lightweight traffic wand is effective at up to 200 mts. A comfortable handhold design with magnetic base, belt clip & wrist lanyard, capable of over 50 hours use with a set of 3 X AA batteries. End mounted 1X white LED headlight makes this an ideal general purpose traffic wand.